The Confederation of African Football (Caf) says the suspension on Benin has been lifted, after the Football Federation held its elections on Friday, a day later than scheduled and despite a court injunction. The team had been serving a ban from world football which could only be lifted if their Federation polls were held by 11 June. 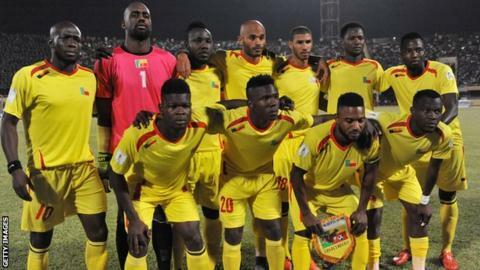 Benin were keen to do so in order to play Equatorial Guinea in a 2017 Africa Cup of Nations qualifier on Sunday. and avoid disqualification. The election was attended by delegates from Caf and Fifa, and Caf has confirmed that the ban on Benin has now been lifted and they will be able to play Equatorial Guinea on Sunday as planned. Moucharafou has held the post previously but is a controversial figure, having been accused of embezzling US$650,000 sponsorship money from a mobile phone company between 2008 and 2010. The clubs argued the current normalisation committee running the sport in the country had violated the statutes of Benin's Football Federation in organising the elections. Benin need to win their final two games against Equatorial Guinea and Mali to qualify for the Nations Cup as the winners of Group C.